"Be able to live simply, but live your highest vision." A driven man who is passionate about a bountiful future, Michael has created Living Roots Ecovillage, where they practice community agriculture, sustainability, and spirituality. He’s not just a great farmer, but a wonderful teaher and father to those around him. 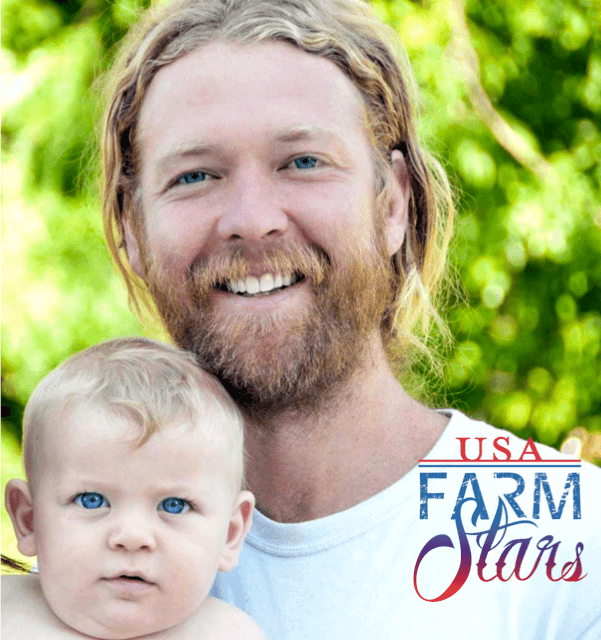 He definitely fits the definition of a Farm Star. Music: Diversified – from hard rock to bluegrass to world music. Blue Jeans: Practical farm clothing, whatever I have. Thing to do AFTER work: Spend time with my little boy. I have one son, named Leo. He said garden for the first time this week. He loves the outdoors, and has been going to the farmers market since he was 3 weeks old. He’s a farm baby, loves elements, animals and everything. I’ve been to all 50 states and to 40 countries on five continents. The farthest is Southeast Asia, Thailand, Cambodia. I’d like to go to South America. Take control of money and your life. Be able to live simply, but live your highest vision. Don't just live for money. I have a business background that wasn’t really agreeing with me. I knew I wanted to do something deeper and be of more service to the world. I wanted to do something more enjoyable and that I was more passionate about. So I traveled a lot and what I came to was going back to my roots. My grandfather was an organic farmer in the 60’s – so I opened my seeds up and that’s what came out of it. Raising the money, legal organizational stuff, finding the land, the right people and all the physical work that we’re still doing to make the transition –but it’s so satisfying. The endless opportunities that we farmers have for growth and improvement in our current situation. Tell us about a day on the farm; when does your day start and end? A couple days a week, we do healing arts or balancing acts – yoga and message training are the most common examples. We work hard; do things to keep body and minds healthy. Our farm doesn’t have much machinery. It’s people powered, hands in the dirt a lot, intensive planting, permaculture, raised beds, planting in a small area, very abundant per acre, very rich and deep, our daily lives are rich and deep. We’re eating well from the garden, having fun cooking and just eating tasty food. What makes me the most happy is when our team is really gellin’, having fun, working together and enjoying our time as a community. The most difficult thing is when there is no solution and things are outside of our control, such as the weather. When we have a good relationship with our land, we just keep finding it to be more and more abundant. What can be is really beyond our dreams. Just go do it. Don’t worry if you don’t know all the details or you don’t have the background, just dive in and focus on it. Just take one step at a time. It’s going to take time but just do it. Anything to say to people who aren’t farmers? Connect with farms one way or another, whether it’s through CSA, starting your own garden, getting involved in political activism. One way or another connect yourself to the farming world. Farming is too big a part of our lives to be totally disconnected from our food. That we don’t have many young farmers. I think I’ll be very grounded in Ecovillage. I don’t know exactly though because I’ve always been an open person. Life has always presented me with opportunities I never would have imagined.